In a few weeks time, London’s latest tourist attraction opens as the viewing floors at the top of The Shard skyscraper start welcoming their first paying customers. Between now and then, around 12,000 locals will get to test out the facilities, and a few of us were up there earlier this week for a look around. I have a bit of a love-hate relationship with the building. From a distance, it is OK, even if the glassy blue shard of glass we were promised looks more like a galvanized steel nail. It is up close that I have concerns, as frankly, it looks cheap. There seems to be very little external detailing such as how the building rams into the ground rather than having neat edging around the pillars and walls. Subtle, but a few thousand pounds here and there at the point that the public can get closest to the structure makes a huge difference. Compare the Gherkin to the Shard at the ground level and the difference in quality is clear, and important. So, will I be a petulant Guy de Maupassant and declare that the best place to be is at the top of The Shard as it is the only place I can’t see it? What is formally known as The View from The Shard has its entrance in one of the rather fetching brick arches underneath London Bridge and once through the ubiquitous security scanners, there are now two lift journeys to the top. Straight up to the 33rd floor, which is a dark room with a huge map of London on the floor (and soon to cover the walls), but around the corner and up in the second lift to the 68th floor. Ears may pop on the trip. 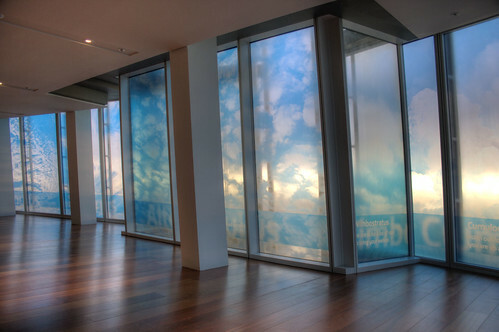 Leaving the lift, you are faced with the glass windows that should provide a vista across London – except that they are covered in blue clouds, which if you look carefully are representations of actual clouds you can see over London. But they don’t want you to linger too long, so deliberately obscuring the view is to get you away from the lift and up a final flight of stairs to the viewing floor itself. Frankly, this is a very polished area and has a quality that is in marked contrast to the exterior of the building at ground level. Even the building facade appears more detailed and interesting now that you are on the inside looking out. Although the viewing area is on two floors, each occupies three stories in height, giving the area a sense of grandeur which might be lacking if they had gone for three double-height floors. 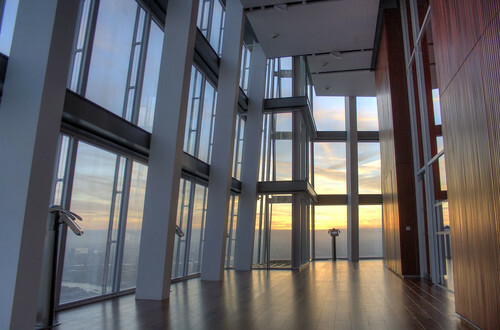 This is however an enclosed room, albeit one with three floors of glass in front of you to admire the views. It’s the upper level which can leave you shivering either from fright or the cold, as it is open to the environment. Although there are still several stories of building above, this is also where the glass walls start to splinter, leaving gaps in the previously solid walls and letting in the London air and in doing so is more rewardingly challenging for those troubled by heights to deal with. The glass walls are never low enough to peer over, but opening it up to the local weather gives it a connection with the outside that reduces the feeling of protection offered by the safe indoor environment just below. 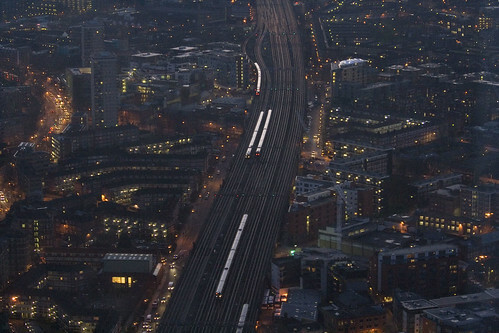 Of course though, this is The View from The Shard, and it is the views that people will come here for. I was able to visit just as sunrise was occurring, as there is a magical moment when there is enough light to see the physical outlines of the buildings, but it is dark enough for the street lights to still be on. On the slightly hazy morning, the views were pretty much limited to Zone 4 of the travelcard, although on a clear day they should stretch further. The lower level also has some disembodied fitness machines, that are actually digitally enhanced telescopes. A local wi-fi connection lets cameraphones send photos to the ground floor to be printed out as you leave. Actually, one of the best places to take photos, if you are a group, is for one to stay on the staircase looking down on to the lower level and photograph the group there. 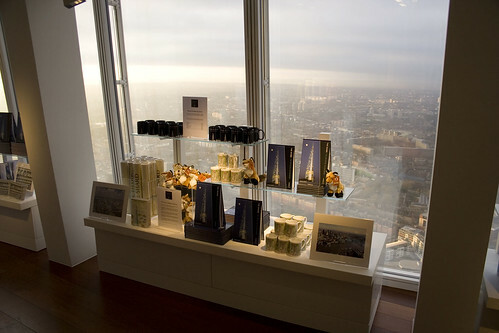 Leaving the viewing gallery, is a small gift shop — obviously — but as it is on the 68th floor, this does make it London’s highest gift shop. I did quite like how the books are stacked on their end like mini-shards. A rather larger version is on the ground floor just in case you miss the smaller one upstairs. The main question is – do I think it is worth it? It is not a cheap place to visit, and at £25 for adults and £19 for children aged 4+, for a family it is going to be very expensive. 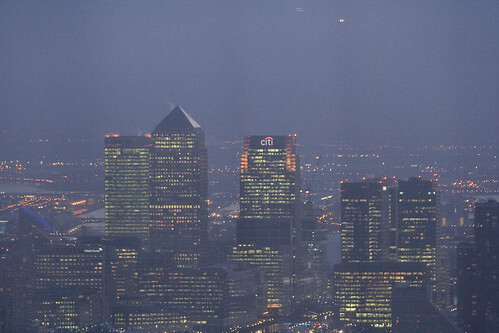 As a one-off special treat, yes frankly, it is the tallest building in Western Europe, so there really isn’t much alternative to see quite so much of London from so high without flying over it. 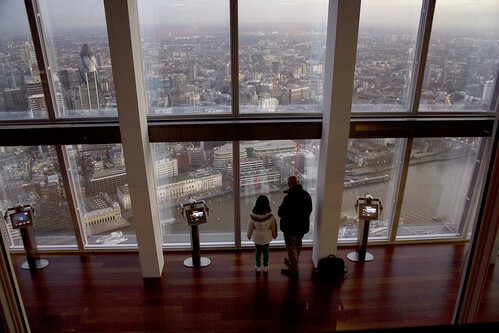 But it is the height that is its only selling point, as other viewing platforms do exist, and have given Londoners an eye in the sky already. Edit – pondering after I wrote this, while the headline charge of £25 sounds high, that is for an hour or more at the top of the building – compared that to 30 minutes rotating on the Eye for £18. Doesn’t look quite so bad in comparison. 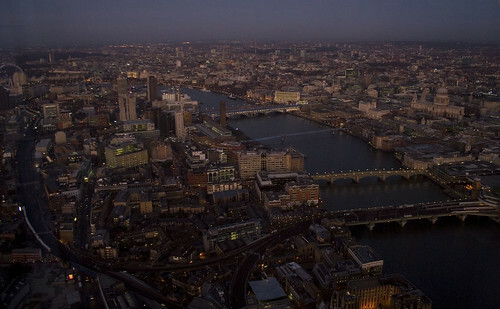 Just time your visit for the sunset hour – to get the magical blending of dusk and night over London. Then you’ll be really getting your moneys worth. 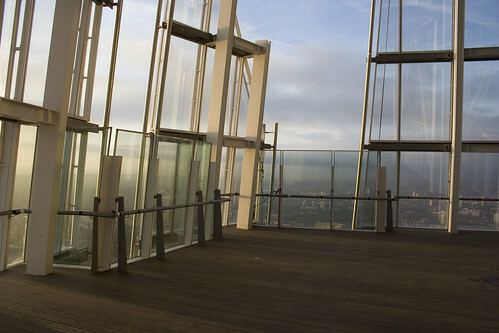 The View from The Shard opens to the public on the 1st February and you have to book in advance. The rest of my 40 photos are over here. Some great views. My wife and I are going on the second day of opening, cameras at the ready! Not great for photography: too many reflections on the inside of the windows, too many raindrops on the outside (and mostly two layers of glass to shoot through), and even on the “open” floor the only way you’ll be able to get an open-air shot is by poking the lens of a small camera through the gaps between the glass frames. (Big lenses won’t fit and the panes seem to be about 2 metres high.) This gives you only one or two rather narrow views on each corner. Undeniably great views for the non-shutterbug, though; best on a sunny day. … on a sunny day or, as Ian says, at dusk, which looks fabulous. Super photos – you got the dawn-timing spot on! 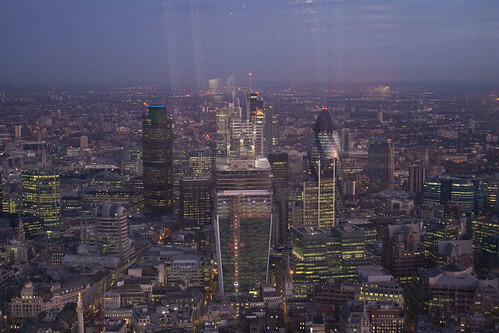 But I must point out that The Shard isn’t the tallest building in Western Europe – nor even in the UK. That honour falls to the Emley Moor Transmitter Tower in West Yorkshire, which is 70 feet or so taller, and is undeniably a proper ‘building’, unlike other guyed or free-standing transmitter masts. So while the Shard is the tallest skyscraper… tallest office block… tallest inhabited building or even tallest building in London it’s not the tallest in the UK. I think it’s passed into the popular consciousness as such because people & the popular media assume if it’s the tallest building in London it must be the tallest building in the UK too. I am well aware of the Emley Moor Transmitter Tower – but I don’t really consider transmitter towers to be “buildings” in the more usual sense of the word. I am sure the semantics can be debated, but I am most certainly not so London-centric as to be unaware of what goes on outside the M25. Emley Moor is classed as a freestanding structure rather than a building – it is the ‘tallest freestanding structure in the UK’. I think the difference is due to usage – Emley Moor isn’t occupied and apart from the equipment hall near the top it doesn’t have floors. If you count Emley Moor as a building then the Fersehturm in Berlin counts too and that is taller as are a couple of Norwegian drilling rigs. Emley and The Shard get pushed down even further depending on where your definition of ‘Western Europe’ is. I saw a camera flash on the way home, I wonder if it will be like the empire state building with constant flashes. I have tickets for the 26th, cant wait. Just out of interest, and not wishing to be argumentative but rather am intrigued, what makes the Emley Moor tower not a building to you? The structure, or is usage? To me – and a lot of people – it is a structure, not a conventional building. 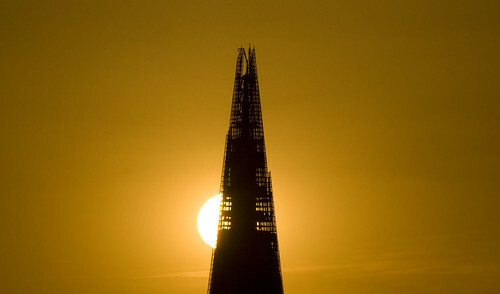 I Loved looking at your photos and reading about your view of the Shard and your tips . I Think its an Amazing Building and really looking forward to going on it.Got tickets for the 1st. But what makes something a conventional building and not just a structure? 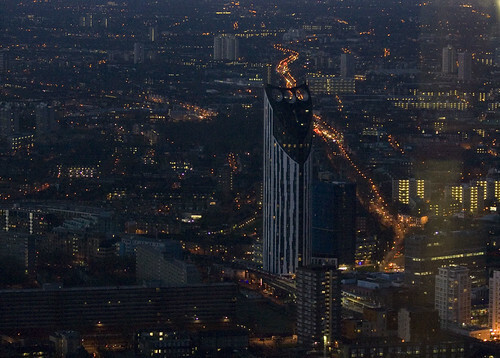 And what about the Post Office tower – would you say that was never the tallest building in London? (Constructed the same way used for similar purposes as Emley). The difference with the BT tower is that it has floors and it is occupied – Emley contains a lift shaft and stairs and a viewing platform. As I recall there are a couple of floors at the bottom and several floors at the top at Emley. But basically you’re saying the difference is how many floors there are in proportion to the height, and what percentage of the time it has people in there? In fact, thinking about I’m sure there are floors inside Emley as they’d need maintenance access to the various pipes and cables that go up & down. I went it up there once a while back but can’t remember how many buttons there were on the lift op’s panel! Anyways, like Ian says – it’s all open for debate. And sorry to bang on, but if anyone is interested my man at Arqiva says that the Emley tower is accessed at ground level daily, 150ft level twice a week and up at the top once a week. So it’s not just an unvisited empty shaft – people are working in there every day, like the PO Tower. So if the PO Tower can be classed as a building I see no reason why the Emley can’t. If you look at any list of ‘Tallest Buildings’ you will see that freestanding towers like Emley Moor or Crystal Palace are not included. Ian y – in our piece about your visit you state that you have an hour at the top. I’ve just booked & it appears from the confirmation email that you only get half an hour – or are they more generous once you are there? from the website: “A standard visit lasts approximately 60 minutes”. Not that I’m going to visit in the near future but is the “60 minutes” a limit? will they chase you out if you overstay your welcome? don’t think so, somehow. Better get some brave guy to take a tent up with him and try camping there! For any technical questions of that nature about the visit – contact the venue and ask them. They are the experts on what their policies are going to be. Sometimes it’s not the size that counts, but the opportunities provided. What a contrast between the landscape of Yorkshire and the metropolis of London. Great that visits have already been offered to locals, and dusk is clearly a good time to go. The gamble is, do you pre-book tickets and risk dismal weather, when even Zone 1 would be a luxury, or gamble on queuing and maybe missing out on a clear day. No doubt things will settle down once it’s been open for a while. To all those with tickets, enjoy! This is SO helpful. Now I know what to expect. I’m going today. Alas currently grey skies, but still, for someone scared of heights the weather is secondary. Thanks! The corners are now closed in, so the photographer has only glass to shoot through. Furthermore a lot of the glass is dirty and it all reflects the white beams. At night they don’t turn down the lights inside, so you have those reflected as well. Budding photographers need an assistant with a large black piece of cloth behind them. Just warning you.